The exhibition central to my latest novel, Rituals of the Dead: An Artifact Mystery, is based on an actual exhibition of Asmat art entitled Bis Poles: Sculptures from the Rain Forest. I can imagine most readers are now thinking – what the heck is a bis pole? These ancestor objects – akin to Native American totem poles – are created to honor the recently departed during a ‘bis’ ceremony. A bis pole is carved out of a nutmeg tree – root and all – meaning they average eight to twelve feet in length. Human-sized figures which resemble the recently deceased are carved into the trunk. Most often they are depicted standing on the shoulders of their forefathers. The tree is carved upside down so the root protrudes out of the topmost figure’s abdomen. This wing-like protrusion or ‘tsjemen’ is carved into a lattice-like pattern. Children and birds are often woven into it. After the pole has been painted and decorated, it is tied to a scaffold constructed in front of the Men’s House, where it remains on display for the duration of the bis ceremony. Before Catholicism took hold in the 1960s, the six-week long bis ceremony always ended with a headhunting raid. Today they are carved for tourists, collectors, and museums during a bloodless ceremony. Two ways of showing the recently deceased “standing” on their ancestors’ shoulders. The bis poles featured in the Sculptures from the Rain Forest exhibition were primarily collected from the Asmat region of Papua when it was still a colony known as Dutch New Guinea. The villagers in this area are famous for their exquisite wood carvings and bis poles are considered to be the highpoint of their craftsmanship. Since Westerners gained access to the region in the 1930s, they have been a cultural artifact much desired by private collectors and museums. Here the child is quite large and distinct. The bird carved into the top of the ‘tsjemen’ is far more abstract. In 2008, I worked on this exhibition as a collection researcher for the Tropenmuseum, Amsterdam’s anthropology and ethnography museum. My main task was conducting archival and photographic research into the poles and those who collected them. I also got to visit the depots of several museums and view many of the objects to be displayed before they were brought to the Tropenmuseum. My novel begins with Zelda Richardson attending the fictitious opening of seven crates containing bis poles. In my book, these wooden boxes had been placed in storage the moment they arrived at Rotterdam’s Wereldmuseum in 1962 and never been opened. As unbelievable as it may seem, this really did happen to a collection of Asmat artifacts and I was lucky enough to be there when the crates were finally opened. In contrast to my novel, there was no fanfare or press coverage. The only people present were a small group of curators and museum personnel more concerned with mold and insect damage than showing the artifacts off to the media. As I describe in Rituals of the Dead, these objects were desired because they were illustrations of the Asmat’s exotic ‘otherness’. During their three-month long boat journey to the Netherlands, a cultural shift took place. By the time the crates landed in Europe, they were regarded as symbols of colonial inequality and the poor treatment of “third world countries” by Westerners. Several crates of Asmat artifacts collected for Rotterdam’s Wereldmuseum were deposited into their depot and purposely forgotten about. Similar objects were removed from museum exhibitions around the world and replaced with dioramas, photographs, maps, and traditional costumes. Art restorer at the Tropenmuseum. The poles are being restored in the Light Hall because they are too large to fit in the restoration lab! 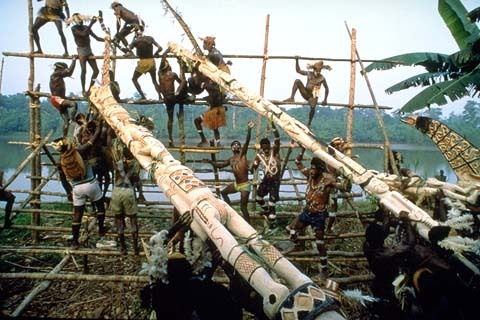 Nowadays, these poles are no longer a shameful reminder of colonial attitudes, but are celebrated as examples of the Asmat’s artistic mastery. You can find exquisite examples on display in the Tropenmuseum, Mission Museum Steyl, Wereldmuseum, National Ethnographic Museum in Leiden, and Museum Bronbeek. You can read more about the Asmat and their art in the exhibition guide – Bisj-Poles: Sculptures from the Rain Forest*. A short video of the award-winning exhibition is also online. Bis poles waiting to be restored in the Tropenmuseum’s Light Hall. If you are in Amsterdam before mid-April, you can see twelve of these beauties being restored in the Tropenmuseum’s Light Hall. Here are links to two videos about the restoration project, made by the Tropenmuseum and posted to their Facebook page (Bis poles update 1, Update 2). It’s well worth the visit to get a close-up look at these magnificent ancestor poles! * Bisj-pole or bis pole? Technically, the title of the exhibition and book referenced in this article is: Bisj-Poles: Sculptures from the Rain Forest. In the Netherlands, ‘bisj’ is the English spelling of the word. Yet in virtually all English-speaking countries, it is spelled ‘bis’. I have chosen to use the more common spelling – bis – in my novel. You can also read more about the bis poles’ symbolism and meaning in an excerpt of my new novel, Rituals of the Dead, by clicking here.